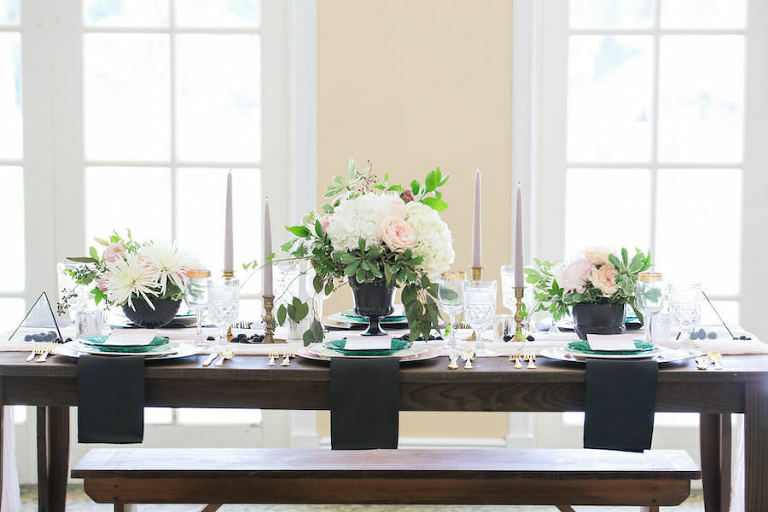 This styled shoot at New Tampa wedding venue Tampa Palms Golf and Country Club showcases a new wedding trend that we’re noticing, the mix of modern and vintage elements. 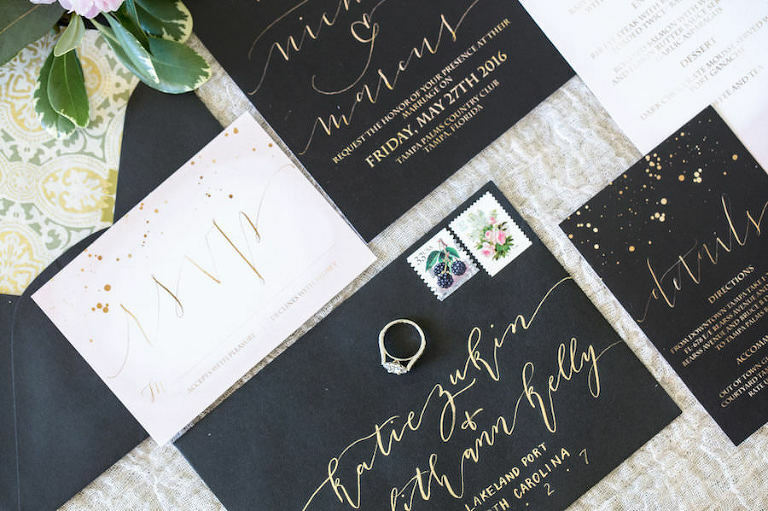 While the theme was natural fit for the wedding designer, the colors were more of a challenge. To highlight how a vintage wedding decor complements more elegant wedding venues, Cassandra chose Tampa Palms Golf and Country Club. One of the designer’s favorite subtle decor elements from this styled wedding shoot included a bold summer fruit. 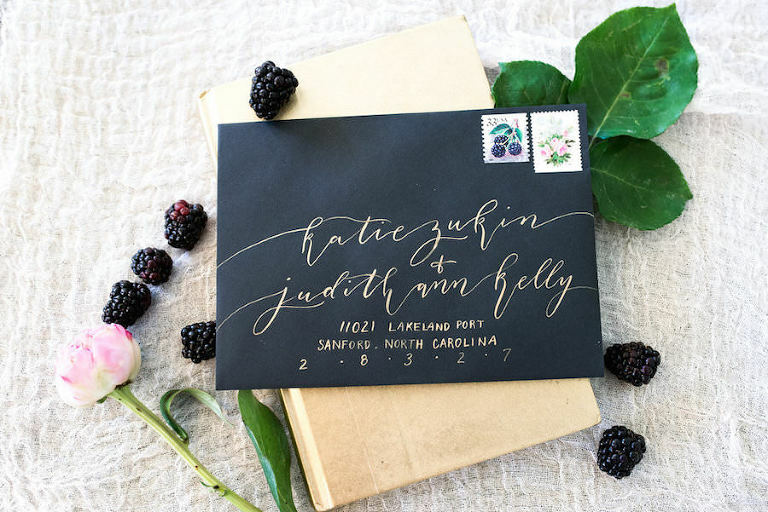 “The blackberries were such a fun accent, offering a pop of contrast to the table. While it might not be as practical to sprinkle blackberries down your wedding table, I think having small dishes of fruit on the tables with a few fallen berries here and there would offer a fun treat for your guest and a great alternative to candy. Especially, if your favorite fruit is in season!” Cassandra shared. I would consider the style or theme to be modern vintage. I think that when someone hears “vintage rentals” visions of your grandmother’s favorite sofa, vintage china with busy patterns or primitive old antiques, like trunks and crates start dancing through your head. While I love these things, vintage rentals can really be more versatile than that. When coming up with the concept of this shoot, I wanted to demonstrate how common vintage items can be used in a way that appeals to a more clean modern look. A fun fact about me, black and green are actually colors I really don’t care for! However, a dear friend gifted me with a set of really pretty Princess House Fantasia emerald green plates and goblets, and I actually liked the shade of green. I think a big part of the color selection was due to the plates, but also I wanted to challenge myself to work with something outside of my comfort zone. Now blush I love! I added the blush because it helped to soften the bolder colors. I enjoyed creating in unfamiliar territory and left the shoot with a new found appreciation for black and green! 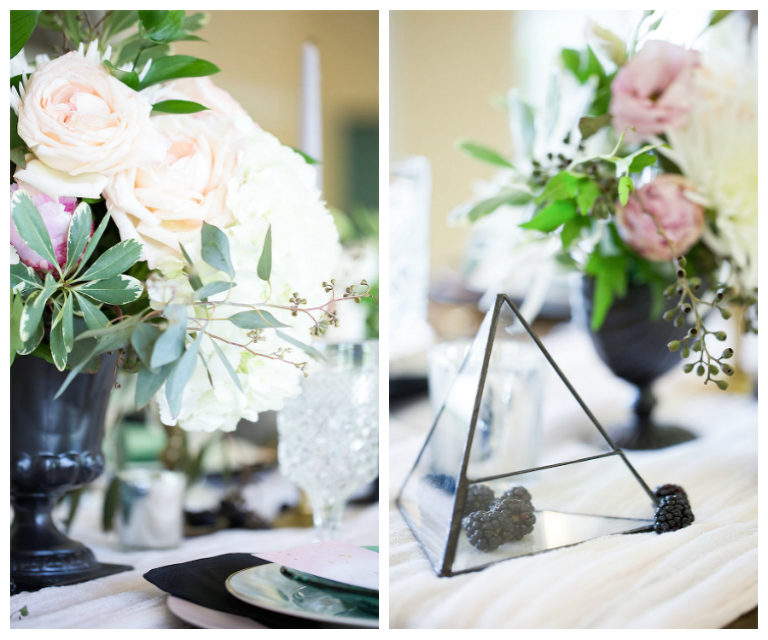 What was one of your favorite elements of this styled shoot? Oh wow, that’s hard. The blackberries were such a fun accent, offering a pop of contrast to the table. While it might not be as practical to sprinkle blackberries down your wedding table, I think having small dishes of fruit on the tables with a few fallen berries here and there would offer a fun treat for your guest, and a great alternative to candy. Especially, if your favorite fruit is in season! How much would you estimate this wedding would cost for 150 guests? Venue: Contact | Planner: $5,000-$5,500 | Photography: $1,500-$2,500 | Farm Tables: $2,000 | Dish Place Settings: $1,000-$1,500| Vintage Decor Rentals: $500-$1,000 | Flowers: $$1,500-2,500 | Cake: $850-$1,000| Invitation Suite: $700-$1,000 | Calligraphy: $900 *This estimate does not include all aspects of a wedding such as officiant, dress, hair and makeup, entertainment etc.